Recent advances in the fields of cell biology, biomedical engineering and materials science have given rise to the inter-disciplinary field of tissue engineering. Recent advances in the fields of cell biology, biomedical engineering and materials science have given rise to the inter-disciplinary field of tissue engineering. 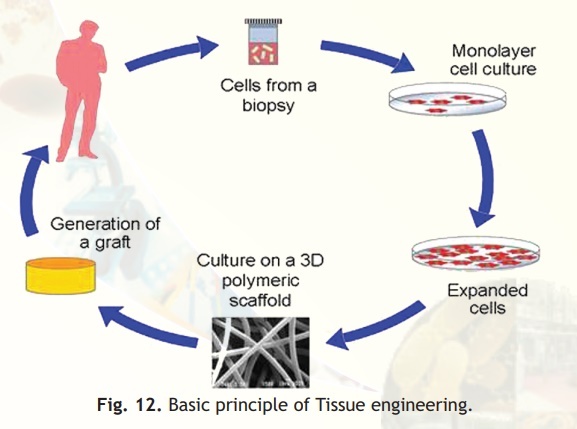 The aim of tissue engineering is to supply body parts for repair of damaged tissue and organs, without causing an immune response or infection or mutilating other parts of the body. Tissue engineering potentially offers dramatic improvements in low-cost medical care for hundreds of thousands of patients annually. Large scale culturing of human or animal cells-including skin, muscle, cartilage, bone, marrow, endothelial and stem cells-may provide substitutes to replace damaged components in humans. Naturally derived or synthetic materials may be engineered into "scaffolds" that when implanted in the body could provide a template that allows the body's own cells to grow and form new tissues (Fig. 12). Such implants could function like neo-organs in patients without triggering immune responses. Genetically-modified animals may also provide a source of cells, tissues, and organs for xenografts.